Deceiving sedge (Carex saliniformis), rhizomatous perennial. Vesta F. Hesse 457 (JEPS27484), “Boggy ground near Camp Evers, elev. ca. 400 ft.,” Scotts Valley (Santa Cruz County), May 23, 1944 [occurrence extirpated]. Photo © Steve Matson. Deceiving sedge (Carex saliniformis), terminal staminate inflorescence. Vesta F. Hesse 457 (JEPS27484), “Boggy ground near Camp Evers, elev. ca. 400 ft.,” Scotts Valley (Santa Cruz County), May 23, 1944 [occurrence extirpated]. Photo © Steve Matson. Site of former Camp Evers marsh, Scotts Valley (Santa Cruz County in 2005). Photo © Dean W. Taylor. Moist areas including pond and lake shores, marshes, bog and fen margins, wet meadows and seeps, and openings in coastal scrub, coastal prairie, and redwood–mixed-evergreen forest; < 250 m (CNPS 2010, Zika et al. 2015, CNDDB 2018). [In Group 8 (Section Bicolores) with styles 2 and terminal spikes generally staminate, lateral generally pistillate.] Rhizomatous perennial herb. Culms to ca. 15 cm tall; distal angles blunt, glabrous. 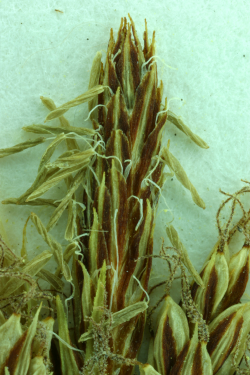 Lateral spikelets generally 2–4, occasionally > 1 per lower branch, stalks long; inflorescence bract generally > inflorescence; sheath > 4.5 mm. ; proximal pisitillate flower bracts occasionally leaf-like, green, margined white or reddish-brown, with long, stout, bristly ciliate awns. Perigynia 8–20, sessile, plump and succulent, papillate, straw-colored proximally, gradually narrowed to apex, beak indistinct (Zika et al. 2015). According to the Jepson eFlora (Zika et al. 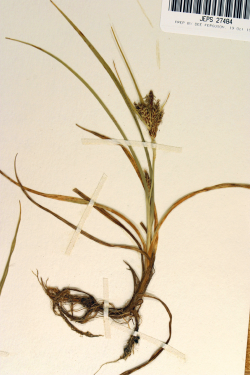 2015), Carex saliniformis is weakly separated from Carex hassei and requires more study. Barbara Wilson et al. 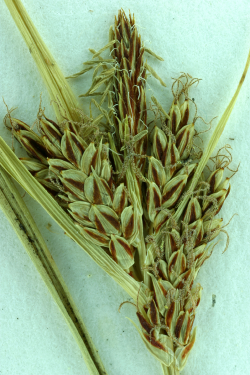 of the Carex Working Group (2008) note that the “taxonomy of Carex hassei and relatives is controversial,” needing revision. Carex saliniformis is treated under C. hassei L. H. Bailey in the Flora of North America treatment (2002). Carex hassei is a wide-ranging species, occurring from British Columbia south to San Diego County, and east to Utah and Arizona; < 2900 m.
Carex saliniformis can be distinguished from C. hassei by the reddish-brown or purple-splotched distal portion of the ripe perigynia (vs. generally green or white in C. hassei), the generally longer awn length on the lower staminate flower bracts (≥4.5 mm vs. blunt or short-awned in C. hassei), and its coastal distribution. This California endemic occurs in the North Coast (NCo) in Humboldt, Mendocino, and Sonoma counties, and the San Francisco Bay Area (SnFrB) in Santa Cruz County. Carex salinaeformis (archaic spelling) was described by Carex authority Kenneth K. Mackenzie (1877–1934) in 1909, based on a 1866 specimen collected by Henry N. Bolander (1) (No. 4702) “in [a] swamp near Mendocino City.” The specimen was initially identified as Carex salina Wahlenb. var. minor W. Boott, but in his description, Mackenzie states that “the strongly developed sheaths of the bracts forbid any such disposition as do also the noticeably nerved perigynia.” Subsequent Mendocino County collections were made by Joseph Burtt Davy at Fort Bragg and the Noyo River in 1899 and 1900, respectively. In A Flora of California (Jepson 1922) and An Illustrated Flora of the Pacific States (Abrams 1923), the species was placed in Section Bicolores (Tuckerman ex L. H. Bailey) Rouy, along with C. hassei and C. aurea. At the time these texts were published, the known range was limited to the Mendocino County coast, despite a disjunct 1921 Joseph P. Tracy collection (No. 5863) from Humboldt County at Stone Lagoon, still the northernmost locality. Additional collections in the 1930s were made near Point Arena, Mendocino County by Lewis Rose, and near Gualala, Sonoma County by Alice Eastwood et al. In 1944, Carex saliniformis was documented in our area by Santa Cruz County botanist Vesta Hesse (2) in “boggy ground near Camp Evers, elev. ca. 400 ft.,” (3) near the present day intersection of Highway 17 and Mt. Hermon Road. This collection constituted another substantial range extension for the species and remains the southernmost locality. Sadly, this occurrence was extirpated in the 1960s when the site was developed for housing. 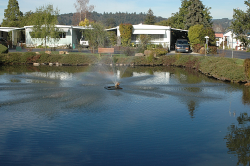 Humboldt, Mendocino, and Sonoma counties support 14 generally small occurrences under a variety of ownerships, including three occurrences that are partially or wholly on lands managed by California Department of Parks and Recreation (State Parks). Centered in Mendocino County, the occurrences fall within seven USGS 7.5' quads. The majority of these occurrences require fieldwork to determine status and vigor of these populations, though all are currently presumed extant. Known threats include mowing, grazing, trampling, road construction and maintenance, development, and any changes in hydrology to the mesic habitats of this species (CNPS 2010, CNDDB 2018). In addition, small populations are vulnerable to random, stochastic events. 1. The German-born Bolander (1831–1897) had succeeded William H. Brewer as the State Botanist for the California Geological Survey in 1864 and traveled widely, making extensive collections throughout the state until the early 1870s (Jepson 1898). 2. “One of the most astute students of the flora of Santa Cruz Co.,” Boulder Creek native Vesta F. Hesse’s (1901–1982) botanical collections (ca. 3350 numbers) formed the bulk of the Santa Cruz County records in the 1961 Flora of the Santa Cruz Mountains of California,by John H. Thomas. She is commemorated with the varietal name for the Calyptridium parryi var. hesseae (CRPR 1B.1), as she collected the type specimen. 3. The site of the largest “mass extirpation” in Santa Cruz County. Camp Evers supported other rare taxa including marsh sandwort (Arenaria paludicola), Mexican mosquito fern (Azolla microphylla), and swamp harebell (Campanula californica). Abrams, L. 1923. Illustrated Flora of the Pacific States, Vol. I. Stanford University Press, Stanford, CA. Ball, P. W. and A. A. Reznicek. 2002. 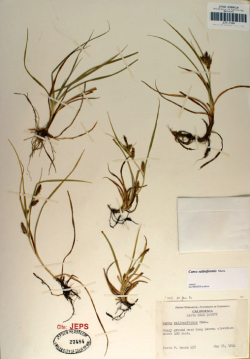 Carex hassei, in Flora of North America Editorial Committee, (eds.) 1993+. Flora of North America North of Mexico. 19+ vols. New York and Oxford. Vol. 23. http://www.efloras.org/florataxon.aspx?flora_id=1&taxon_id=242357229 [acc. 17 May 2018]. California Native Plant Society (CNPS), Rare Plant Program. 2018. Carex saliniformis. Inventory of Rare and Endangered Plants [treatment last updated March 15, 2010] (online edition, v8-03 0.39). California Native Plant Society, Sacramento, CA. http://www.rareplants.cnps.org/detail/1855.html [acc. 17 May 2018]. Carter, A. M. and J. H. Thomas. 1986. Vesta Florence Hesse, 1901–1982. Madroño33(4):307–308. Consortium of California Herbaria (CCH). 2018. [Internet]. [acc. 17 May 2018]. Jepson, W. L. 1898. Dr. Henry N. Bolander, botanical explorer. Erythea 6:100–107. Jepson, W. L. 1922. A Flora of California, Vol. I. Associated Students Store, University of California, Berkeley, CA. Mackenzie, K. K. 1909. Carex salinaeformis. Notes on Carex—V. Bulletin of the Torrey Botanical Club 36:477. Mackenzie, K. K. 1922. A monograph of the California species of the genus Carex. Erythaea8:7–95. Stacey, J. W. 1936. Notes on Carex—VII. Leaflets of Western Botany 1(20):240–241. Wilson, B. L., R. Brainerd, D. Lytjen, B. Newhouse, and N. Otting (Carex Working Group). 2008. Field Guide to the Sedges of the Pacific Northwest, Second Edition. Oregon State University Press, Corvallis, OR. Zika, P. F., A. L. Hipp, and J. Mastrogiuseppe. 2015. Carex saliniformis, in Jepson Flora Project (eds.) Jepson eFlora, Revision 3, http://ucjeps.berkeley.edu/eflora/eflora_display.php?tid=17477 [acc. 17 May 2018].